Posted by elizabethwong in Current Affairs, Democracy, Event, Human Rights, Malaysia, Note2Self, Politics. From Nurin to Chief Justice: A Collapse of Law and Order? Pls come earlier to ensure you have your seat. Posted by elizabethwong in Current Affairs, Democracy, Human Rights, International, Malaysia, Note2Self, Politics. (Updates) Protests all across Southeast Asia today. Most significant was in Jakarta, where50 Indonesian foreign ministry officials, dressed in red shirts, observed a period of silence to express solidarity with Myanmar’s pro-democracy protestors. “We pray that the people of Myanmar will enjoy peace,” said Umar Hadi, the ministry’s director of public diplomacy. Wisma Putra – when are *you* going to do the same? Or it’s business with the junta as usual? News from inside Burma, from my friend, Khin Ohmar, who’s coordinating information outflow, after internet has been cut off in Rangoon. As of this posting (4:00 Burmese Std Time), people in Burma are continuing with their defiance and gathering on the streets again in downtown Rangoon despite of the extreme use of force and violence by the authorities that they have experienced and witnessed over the past twodays – the beating, shooting and killing, and the continuing arrests. There have placed double barricades blocking that no one gets near to Sule Pagoda where shooting and killing took place yesterday. At least 10,000 or so protesters are gathering around the Theinggyi market area in downtown Rangoon and trying to get into group. But soldiers (Battalion 66 as shown on the badges) are patrolling in the area and when they see people starting gathering they fire guns into the air, chase the people and beat and arrest those who could not run. An hour ago, this is the update on people arrested: About 10 people, mostly young women, were arrested in front of Ministers Office (Wongyimyar Yone), Ahnawrata Road. About 50 have been arrested in Theingyi market area. There can be more that we don’t have information yet. (EARLIER) Some 2,000 Burmese and Malaysians joined in a solidarity protest to support the democratic movement in Burma and to protest against the killings of monks, civilians and a journalist. This was one of the fastest mobilisations to date, as a decision was only firmed around 9 pm last night among the organisers. Please help to email out to all your contacts and spend your Sunday evening for this very meaningful event. Please confirm your attendance via email to the undersigned or SMS 012-3915539. Attire: White top. 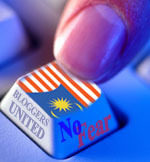 Posted by elizabethwong in "We can do better", Current Affairs, Democracy, History, Huh? !, Human Rights, Malaysia, Note2Self, Politics. The ‘independent’ panel announced by deputy Prime Minister Najib Razak today is nothing more than a red herring. This man is either really stupid, or he thinks we’re stupid? Sack the Chief Justice, period. Put aside his extended contract. Form a Royal Commission to investigate the rest of the judiciary. Purge those in cohorts with Ahmad Fairuz and VK Lingam. A name that one shouldn’t forget, since he was involved in the plot to kick out Tun Salleh Abas during the 1988 judicial crisis. The evidence of Encik Haidar, the then Chief Registrar, shows that as early as 8.30 am on the same day the Acting Lord President had anticipated the possibility of Tun Salleh’s counsel making the urgent application to the Supreme Court and had instructed Encik Haidar that the Registry of the Supreme Court was not to take any action on any such application without first taking directions from him. Collector of ‘positions’ and ‘directorships’. Director of god-knows how many public listed companies. Head of the National Service Training who doesn’t even have the decency to resign after more than a dozens deaths and numerous more complaints. In some crime prevention foundation, which millions have been pumped in, and clearly not prevented the deluge of serious crimes. Oh yah, I think he was even once a Suhakam commissioner, but none of us from the HR groups could remember him, since he did (censored) all for HRs on public payroll. I have no beef with Mahadev Shanker, whom I had good discussions on human rights issues during the Human Rights Commission meets in Geneva as well as in Kuala Lumpur, when he was a Suhakam Commissioner. A rose among thorns. The walk tomorrow is a peaceful stroll to the PM’s Office. Everything humanly possible is being done and has been done over the couple of days to ensure this. The Cabinet has been informed that we are doing this, and handing over a memorandum and a representative will be expecting us. The walk is importantly (1) a show of solidarity of the Bar and civil society’s positions on the issue (2) to send a message that we are serious about wanting a clean up of the Judiciary including by (3) calling for an independent appointments and promotion commission (4) calling for a royal commission to enquire into the recording and the state of the administration of justice in Malaysia. A Star sms has been received about DPM announcing the establishment of a panel to investigate the authenticity of the clip. This does not change anything about the walk. We are still proceeding to walk because the issues we are advocating are not limited to the recording alone but with much larger issues as described above. And would such a decision by the Govt for a panel be set up have been made without the continuous pressure from us and civil society which includes calling for this walk, more so after PM said there would be no royal commission? Believe in the power we all have in making change, and believe in ourselves. We CANNOT be afraid to walk, we CANNOT look lowly on ourselves, we CANNOT give up our country to people who do not deserve to run it. SO PLEASE JOIN THE WALK! Posted by elizabethwong in Event, Malaysia, Note2Self, Politics. First-time ma, Nurul Izzah Anwar gave birth to her first child around six-ish this evening. Please extend your congratulations at Anwar Ibrahim’s blog.